I don't know much about Paul Detlefsen other than the fact that he is a highly collected American realist and that his most popular work is from the '50s and '60s. I don't know when he started painting, how long he painted for and if he is still alive today. I do know that if you are a baby boomer trying to re-accumulate all of the memories from your childhood, you better look into this guy's work. If your parents or a relative had one of his pieces, seeing them again will bring back some great memories. Paul's work usually depicts scenes of rural Americana featuring wet, lush greens and vibrant reds. 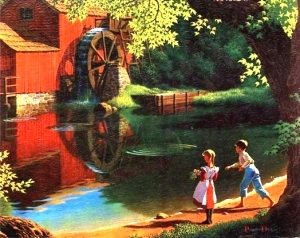 Most of his pieces feature a red barn, a mill, a pond or someone in a straw hat, very Tom Sawyer meets Norman Rockwell. If you aren't overly cynical, the paintings really do convey a sense of peaceful nostalgia. You can find Detlefsen prints all over the web and I am sure at local yard sales and flea markets. Most sell for $20-$40 depending on condition, age, the quality of the frame and the scarcity of the print. Some of his more risque prints like "Wilderness Paradise" and Sweet Leilani" may set you back over $100. "Four Seasons" Puzzles - "Winter", "Summer", "Spring" and "Fall"
D.A.C. Placemats - "Covered Bridge", "Happy Days", "Memories" and "The Smithy"